Friends, are you up for a sweet challenge? When it involves food, I’m always game. Desserts? Count me in! Voortman has been a popular brand in many families’ homes, mine included, for over 60 years. My grandma always had a few packages of Voortman Wafers in her pantry. I remember sneaking some when she wasn’t looking. Sorry Grandma! My kidself couldn’t resist. 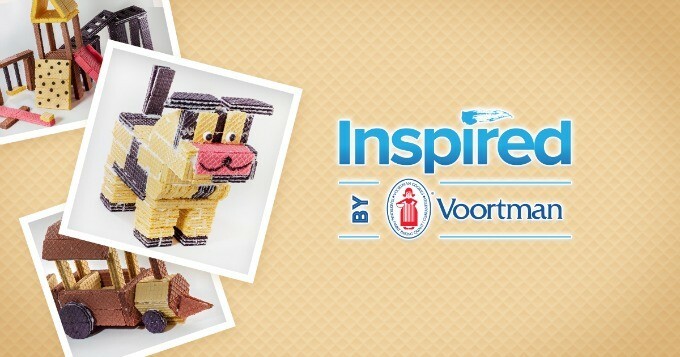 Now, Voortman wants to help inspire you to get creative using Voortman Wafers in their Inspired by Voortman Contest. Voortman is giving away $2,500 USD to two lucky winners. I’d say cold hard cash is a sweet prize too! There are two categories you can enter under and each category has a $2,500 USD cash prize. 1. Wafer Structure: Create a delicious work of art or an object using Voortman Wafers. The wafers must be visible in your creation and ideally should make up the majority of it. 2. 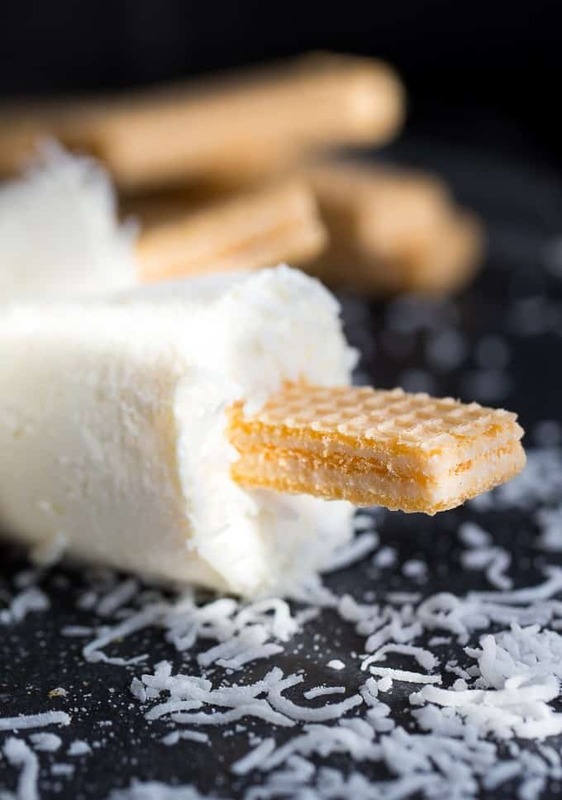 Wafer Recipe: Create a wafer-based dish or treat with Voortman Wafers that you can eat and enjoy. Again, the wafers must be visible in your recipe and must be a primary ingredient. Don’t worry about including a list of ingredients or steps to make your recipe in your entry. 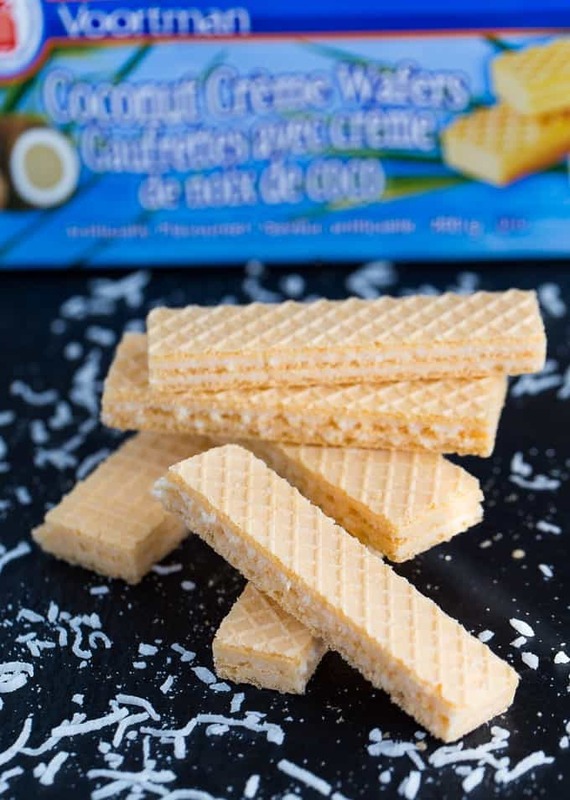 Voortman Wafer Cookies come in a variety of flavours including vanilla, strawberry, chocolate, lemon, coconut, cookies n creme, peanut butter and more. In Ontario, buy them at Walmart, Sobeys, Fortinos, Loblaws, Real Canadian Superstore, Food Basics, Metro, Longos, Canadian Tire and Giant Tiger. Check their Where to Buy store locator to find a store near you. After you’ve made and taken a photo of your recipe or structure, submit your image and your information at Inspired by Voortman. Entrants are allowed one entry per day. The contest runs from May 2 to June 13, 2016 at 12 pm EDT and is open to Canada (excludes QC) and USA (excludes AZ, CO, MD, NE, ND and PR). The winners will be selected by a panel of judges. Make sure to check out the tips and guidelines, the Creations Gallery and contest rules while you are there. That Wafer Poutine in the Creations Gallery is pretty neat! Of course, I had to make something. My mind was brimming with ideas on what would work well for this contest. I can’t win, but I’m sharing just for the fun and to hopefully inspire you to make something unique and/or delicious. At first, I thought of some kind of cake with wafer layers. I was going to run with that until I was shopping in the paper towel aisle and saw those little bathroom cups you use for rinsing your mouth after you brush your teeth. I thought they were the perfect size to make ice pops and use a Voortman Wafer as the stick. It was my own little a-ha moment in the cleaning aisle at Walmart. I settled on using the Coconut Creme Voortman Wafers and knew I needed something to complement the flavour. I went with the obvious – a coconut cream pie filling, but in a frozen format. 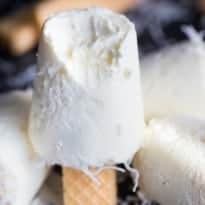 The ice pop portion is made with vanilla instant pudding, coconut extract, shredded coconut and frozen whipped topping. The pudding mixture goes into the small plastic cups. Then place a Voortman Wafer in the centre of each pushing down so it will hold upright. 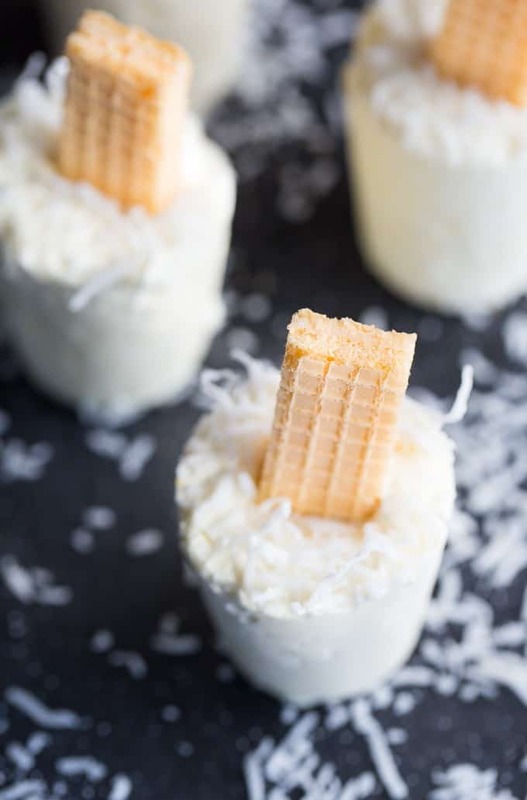 Sprinkle on a little coconut to decorate and freeze for at least 4 hours. I left mine sit overnight so I knew they’d be nice and firm to eat. I carefully removed the cup with a knife and it peeled off into these beautiful treats! They are cold, creamy and coconutty! The best part is you can eat the entire treat with nothing going to waste. I personally don’t like the wooden sticks and much prefer Voortman Wafers. Kids can help make this recipe and will love to eat them. My daughter has been eating them like they are going out of style. Good thing it will be a cinch for me to make more. I might try a few other flavours like strawberry or chocolate. I hope I’ve helped to inspire you to create something delicious or fun with your Voortman Wafers. I’ll be watching the Creations Gallery to check out everyone’s entries. Good luck to all! Connect with Voortman on Facebook, Twitter, Pinterest and Instagram. Cold, creamy and perfectly sweet! This summer treat tastes like a coconut cream pie. Combine pudding, milk and coconut extract in a large bowl and beat on low speed for 2 minutes or until thickened and smooth. Stir in 1/4 cup shredded coconut and whipped topping until smooth. Fill small bathroom cups about 3/4 way full with the pudding mixture. Insert one wafer into each cup. Sprinkle with the remaining coconut. Freeze for 4 hours or overnight for best results. Carefully remove the cup and enjoy your ice pop. Sugar wafers were my absolute favorite treat growing up. I love the idea of using them for a popsicle stick! My youngest loves coconut, I bet he would love to try these out. I do not recall seeing coconut extract at the store – I will have to look for it and give these a try. These are one of our favorite cookies in this house. I never thought about making it into a stick for a popsicle great idea! I’m totally stealing this. I ADORE those voortman cookies. I have been craving them tons during this pregnancy and these pops? Look so creamy and so good! Delicious! I absolutely love the addition of COCONUT to anything! This would be amazing for a sweet treat on a hot afternoon here in Texas! These cookies are some of my kid’s favorite cookies to eat! Love the idea of making them into ice pops like this! Holy freakin delish! These came out super cute and I bet they taste so yummy too! Oh my goodness, why didn’t I think of doing something like this. These look delicious. Like cold and creamy and all yummy! This is a fantastic treat. My family loves Voortman Wafer Cookies. I will have to make these this weekend. I am sure they will be a big hit. 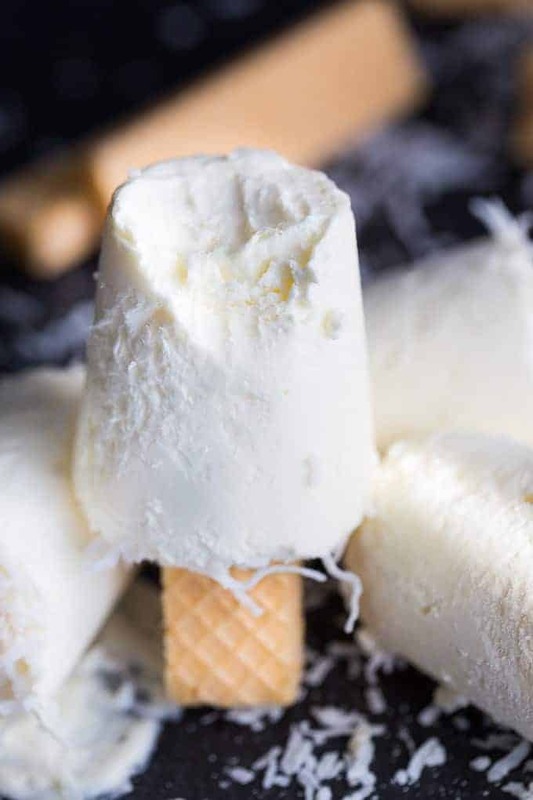 Coconut creme ice pops look so delicious. They will be a refreshing treat this summer. First and foremost, may I please applaud your wonderful food photography? Seriously gets me every single time. Also, what an amazing idea! 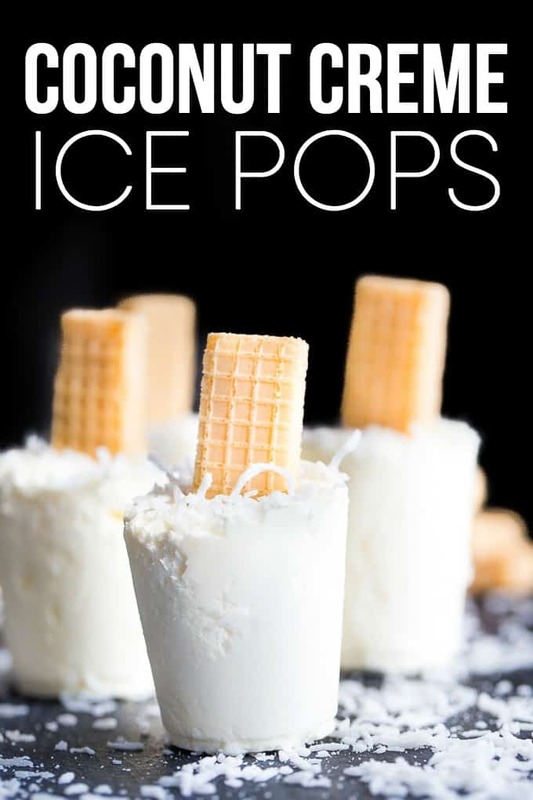 I am finding so much inspiration with frozen pops lately… can’t wait to make some of my own! It’s like all of my favorite things in one delightful summer treat! I am going to make these this weekend! I love how different these are. I bet they taste great too. I like the taste of coconut, so I’m sure I’d love them. I’ll have to make them for my family soon. What a fun way to make a popsicle. They look good. I love these wafers but have never seen them in coconut, which is my favorite flavour for everything! Printed and pinned because I have to try these, hope I can find the coconut wafers! This looks like a delicious and fun treat for summer! Oh my gosh… those look AMAZING!!!!! Holy Moly—that sounds delicious!! Thanks for the summer treat! This looks so yummy…I’d probably eat way too many of these…LOL! Pinning! Oh wow. This looks like loads of fun. I love wafers. Thanks for linking up with us at A Little Bird Told Me Link Party. You’re one of our features of the week! Your recipe is in the TOP TEN features for this week on Full Plate Thursday. Enjoy your new Red Plate and your weekend! 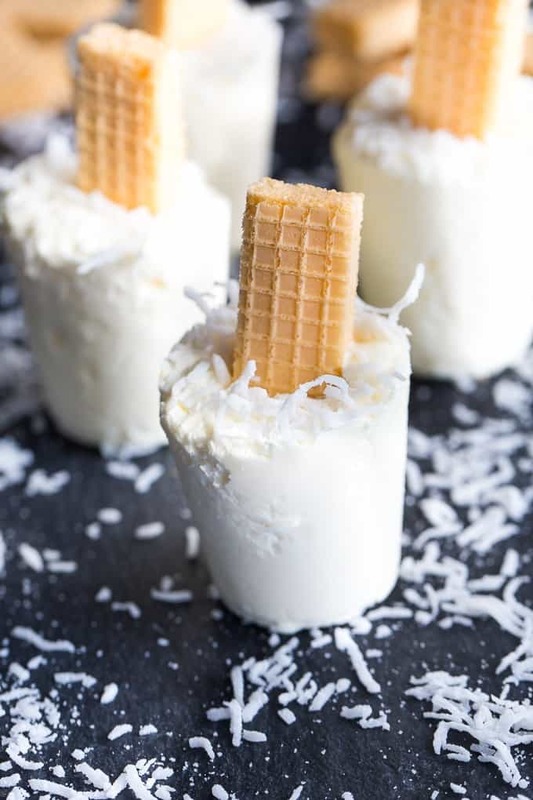 These Cocoanut Creme Ice Pops are the perfect answer to what to have on a hot summer day. I happen to have all these ingredients in my home now and I can’t wait to make them. Thank you for all your delicious dessert recipes. These ice pops look very cool and delicious. I have already saved the recipe. 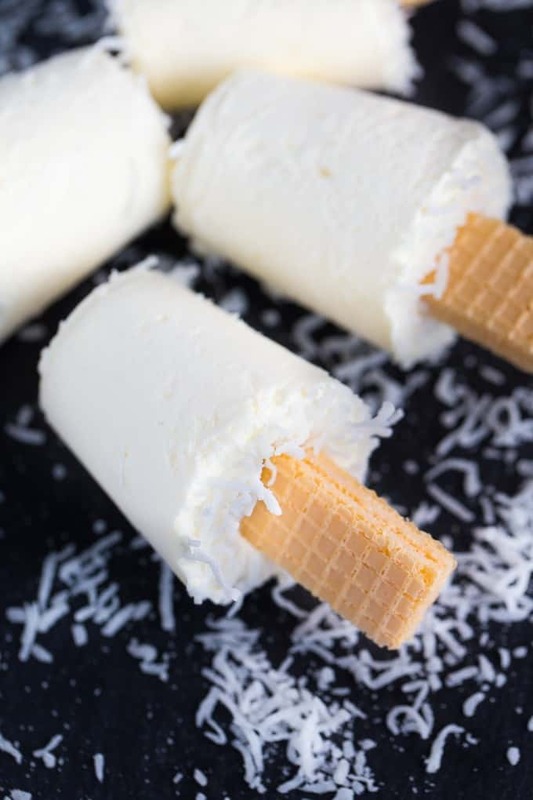 This summer has been so hot and dry that we need ice pops to keep cool and these coconut creme ice pops to cool down. Thank you for sharing with us.